(3)With front USB2.0 port and TF card slot. NEW ARRIVAL. 5)Support Bluetooth hands-free function. 1)7” HD touch screen. Original Xiaomi Redmi Note 5 5,99" 3GO 32GO Snapdragon 636 4G Téléphone Touch ID. (7" 2DIN AUTORADIO. 3)With front USB2.0 port and TF card slot. We will do our best to solve your problem as soon as possible. The item in the actual use of the process of quality problems. We also have a high-standard team, qualified by authorized organizations to ensure products are of the highest quality. 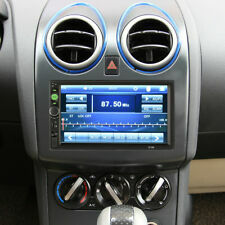 (7" 2DIN AUTORADIO. 5)Support Bluetooth hands-free function. 1)7” HD touch screen. The item in the actual use of the process of quality problems. We also have a high-standard team, qualified by authorized organizations to ensure products are of the highest quality. (Voiture Autoradio. 3)With front USB2.0 port and TF card slot. 5)Support Bluetooth hands-free function. excluded.). Local pick up is not available. 1 Operation Manual. 2 Power Cable. English, Traditional, Spanish, Portuguese, Russian, Italian. Audi A3, S3, RS3 RNS-E. Audi A6, S6, RS6 RNS-E. Audi A4, S4, RS4 RNS-E. NEUF Adaptateur CABLE FAKRA Audi RNS-E. Audi TT RNS-E.
Duty-free Android 6.0 Octa Core 1024 * 600 DVD de voiture Navigation GPS lecteur multimédia stéréo de voiture pour Audi TT MK2(2006-2014) radio Commande au volant avec 3 G WiFi Bluetooth carte SD gratuit. (5)Support Bluetooth hands-free function. 1)7” HD touch screen. excluded.). Local pick up is not available. 1 Operation Manual. 2 Power Cable. English, Traditional, Spanish, Portuguese, Russian, Italian. (3)With front USB2.0 port and TF card slot. 5.45" Xiaomi Redmi 6A 2 16GB Helio P22 QuadCore GLOBAL OTA 4G Smartphone Face ID Bluetooth Car MP5 Player FR. 1)7” HD touch screen. Xiaomi A2 Lite Global 4 64Go Smartphone OctaCore 4000mAh Snapdragon625 Téléphone 636 4G Téléphone Touch ID. S4 RS4 8E 8F B9 B7 RNS-E. SEAT EXEO (2009-2012). INTERNET / WIFI. ANDROID 8.0 / 64 BITS. ANDROID 8.0. AUDI A4 (2002-2007). - Soutenir le dernier lien miroir avec iPhone via WiFi et avec Smartphone Android via USB ou WiFi. FORD alle Modelle 2003->. BMW alle Modelle 2002->. OPEL Astra H 3/5 Türer 04/04 ->. OPEL Astra H Berlina 4 Türer 04/04 ->. Compatible avec : AUDI alle Modelle 2002 ->. OPEL Astra H Kombi 04/04 ->. ADD TO FAVS. Huawei Honor 7X. CHUWI Hi10 Plus. Nextbook Ares11A 11.6". Teclast X80 Pro. 7" 2DIN AUTORADIO. Outil de diagnostic. Smart Watch. Audi / Seat / Skoda / VW (Quadlock) > Parrot. Seat RNS2, MFD2 (Altea). Skoda RNS2, MFD2 (Octavia), Columbus, Amunsen. VW RNS2, MFD2, RNS300, RNS-300, RNS310, RNS-310, RNS315, RNS-315, RNS500, RNS-500, RNS510, RNS-510. AUDI RNS-E / RNSE, BNS. Blaupunkt Travelpilot EX. AUDI RNS-E / RNSE, BNS. Skoda RNS2, MFD2 (Octavia), Columbus, Amunsen. Seat RNS2, MFD2 (Altea). Blaupunkt Travelpilot EX. Fixation magnétique. (3)With front USB2.0 port and TF card slot. 5)Support Bluetooth hands-free function. Mini LED Portable Projecteur avec USB-SD-AV-HDMI pour loisirs Maison Film, Vidéo. FREE Wireless QWERTY Keyboard! FEATURED PRODUCTS. ACV Electronic facade d'autoradio pour Audi A3 a partir de 12/00 / A6 11/00 / Seat Toledo Leon. Câble adaptateur antenne pour autoradio ISO vers FAKRA double. AUDI - VW - SKODA - SEAT tous modèle a partir de 2002. (5)Support Bluetooth hands-free function. e Trancheuse De Précision FR. 373x279x275mm Trancheuse Électrique Professionnell. Nouveau 1.8m- 4m Coupe Manche Télescopique Sécateur Ebrancheur Couper 2 OPTIONS. (3)With front USB2.0 port and TF card slot. 1)7” HD touch screen. 5)Support Bluetooth hands-free function. 87.5~108.0MHz. MOSFET Amplifer. Screen Resolution. (5)Support Bluetooth hands-free function. 1)7” HD touch screen. Floureon 2 Batterie LiPo 2S 7.4V 5200mAh 30C T Plug RC Evader BX Voiture Drone. BUY IT NOW. ILIFE V5S Pro Aspirateur Robot Poussière Smart Balayeuse Humide/Sec Nettoyeur FR. NEU Antennenadapter FAKRA Audi RNS-E. Audi TT RNS-E. Audi A3, S3, RS3 RNS-E. Audi A6, S6, RS6 RNS-E. Audi A4, S4, RS4 RNS-E. Le 03-juin-15 à 00:34:21 Paris, le vendeur a ajouté les informations suivantes . Convient aux modèles ： Audi TT (2006-2013). À propos de nous. Format de musique: MP3, WMA, AAC, RM, LFAC, etc. Plage de sortie Vidio: 1.0V-1.2V (75Ω). Puissance de sortie maximale: 4 50W. Paramètres multimédia. Modèle : TT 2.0 TFSI 16V TURBO. Type Mine : MAU38H1MP010. Code couleur : NC. Couleur : BLANC. Puissance DIN : 200. Cylindrée : 1984. Type Boite : KNC - 6 Automatique. Type Moteur : BWA. Volkswagen, Seat, Audi, Skoda, Ford. SEAT RNS MFD, SEAT MCD. Skoda : Fabia 2000 et /Octavia 1998 - 2005 /Superb 2002 et . Ford MFD, Ford MCD. Skoda MFD / MCD. Seat : Alhambra 2000 et /Aura tous les modèles /Ibiza 1999 et /Leon 2000 - 2005 /Toledo 1999 - 2005.